Would you like to connect with other Missouri Fox Trotter owners in your area? Are you seeking tack, training or stallion services? The MFTHBA’s Fox Trot Service Net is a program that brings together those who are seeking services and information related to the Missouri Fox Trotter and those individuals and businesses who provide such services. You can search for a particular provider by location (click on the state link to find someone in your area) or by category (utilize the advance search option and select the service you are interested in). 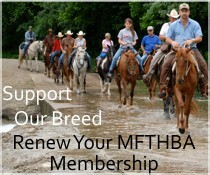 If you are an MFTHBA Member interested in becoming a Fox Trot Service Net Provider, fill out the Fox Trot Service Net Form (you will be asked to log into the Members Only Area) or use the PDF form and mail to MFTHBA PO Box 1027 Ava, MO 65608. The Fox Trot Service Net is provided as a service to the owners and enthusiasts of the Missouri Fox Trotting Horse to promote our breed and our industry. Its purpose is to provide information only, without implying any recommendation as to where to locate Missouri Fox Trotting Horses. Neither the MFTHBA nor it’s web page editors are responsible for accident, injury, or damages, personal injury, property damage, loss of service, loss of income or any other damage whatsoever, as a result of the use of this service. The user accepts all responsibilities for using this service. We cannot be held responsible for claims made by those listing products, horses, or services on these pages. Although the intent of the Fox Trot Service Net is to provide service to the MFTHBA membership, the MFTHBA reserves the right to refuse usage of this service to anyone for any reason at any time. The MFTHBA is not responsible for any misuse of information you provide to this service by visitors to the site.